Cast: Ji Sung, Bae Chong Ok, Yu Oh Seong, Seo Ji Hye and Ko Joo Won. As one of the kingdoms of the North is on the verge of destruction, the pregnant queen Jung Kyung Bi (Bae Chong Ok) flees in order to keep the royal line intact. While doing so she is hit by arrows and barely survives when she boards a ship sailing south. On the boat she gives birth to a boy, but due to her wound and being exhausted she passes out. The ship encounters harsh winds and crashes, leaving only ship wreckage on a shore. A maid from the Iron Masters house spots the wreckage and notices that the newborn baby is still alive, and decides to take him with her. Shortly after Kyung Bi wakes up, but unable to find her child she breaks down. At the same time the Iron Master wife gives birth to her third stillborn, and he is unable to tell his wife. The maid who found the child on shore tells the Master about the child, and in order to save is wife from depression, decides to make the child his son, calling him Soo Ro. In the south the 12 tribes are having problems agreeing on trivial matters, so they go to the High Priest in order to get answers, this furies one of the richer tribe leaders Shin Gwi Gan (Yu Oh Seong) as the High Priest almost becomes the king, as he is liked by all but also deals with all the main issues. When a prophecy, which says that the future king will be a child born by a woman from north, is given to the High Priest, he meets Kyung Bi and finds out about her background. He decides to marry her, and makes sure that he will be in the same position. 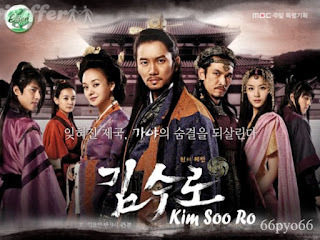 Several years later Soo Ro (Ji Sung) now old enough to learn from his father’s iron crafts, is met with hostility from the High Priests son Lee Jin Ah Shi (Ko Joo Won) and Kyung Bi, since they fear of him being a 'potential' king. And the tribe leader Shin Gwi Gan refuses to let anyone take his throne. Will the real heir be able to become king? I apologize for the long review; another period/historical story that starts late into the drama. This is my second drama about the period before the Joseon era, my first being Faith. And comparing those two would not be all that fair, even though I liked this one better. This drama had the element of fantasy, as in magic – which Faith also had, just not the same kind – and prophecies, which apparently used to be quite normal then. I am really not familiar with the story of the pre-joseon era, but from what I know they are coming quite close to the actual story. Though I really don’t understand the use of the second lead – like she was quite unnecessary. I didn’t feel bad for her, and I honestly didn’t get her backstory – not that it was interesting. I get that they were trying to make it sad and heartbreaking, but I actually was waiting for her to leave already… I know: mean. But yeah, I guess people like these types… I just don’t. But yeah, I found it pretty interesting to watch, so all in all fairly good watch.